Let’s talk New Zealand! I’ve gotten a few requests from readers (love getting these!) for my New Zealand itinerary. While I’m certainly no expert, I did spend three weeks driving what was essentially the entirety of the country. I did talk with a lot of Kiwis (as will anyone who travels there, they’re the nicest people on Earth!) So with a little bit of research and a bit more of experience, may I present…. I’ll start with two weeks, because if you are indeed a part-time traveler as I am, that may be the most that you can gather to be there in one trip. 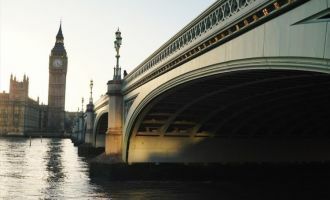 I will also include a more comfortable three-week itinerary–which is close to the one I followed–as well as a longer 4 week one to accommodate a few other schedules. Please note: two weeks is the absolute minimum I would plan in New Zealand. Though fast-paced, it can be done, and you can see a lot of the highlights. It depends on your preferred speed of travel; I know some people would prefer to just see the North Island and come back a separate time to see the South. 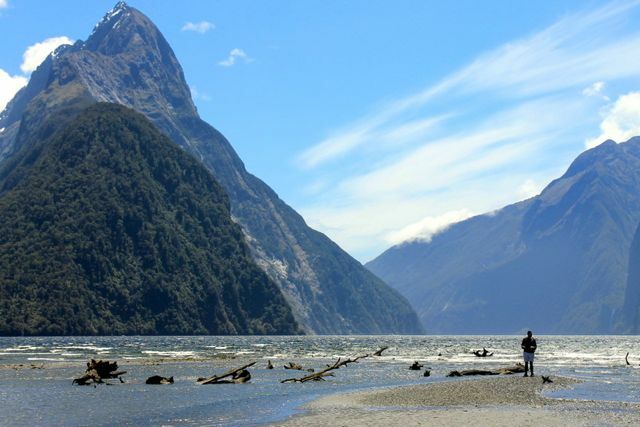 Others have shared they may never return to New Zealand, so they want to see what they can in the time they are there. I can’t recommend enough that you extend your time to 3-4 weeks here if possible. I will give you an overview of places and sights, but it’s important to remember that as with any itinerary, things can and will arise out of the ordinary…and that’s half the fun! Keep in mind that much of this dual-island trip is spent driving. It’s probably the only country in the world where I would truly enjoy that much time on the road. Also note that this two week itinerary does not include travel time to/from the country. It could be as simple as an overnight plane from LAX or as long as a two day journey from Europe. It depends where you are traveling from, of course. 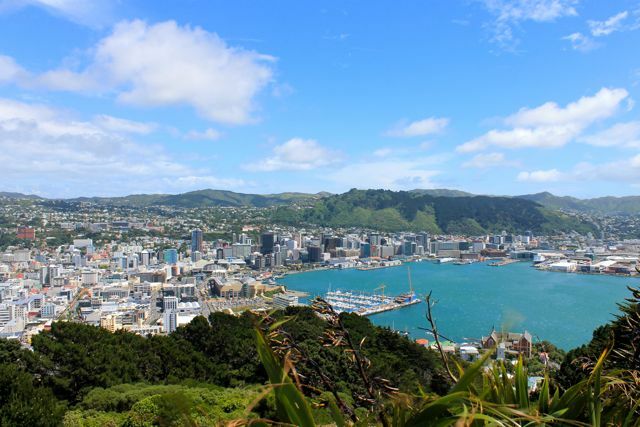 Save money by catching an early morning flight all the way to the South Island, where you can hire a car and see the country for what is generally a much better price than starting in Auckland. 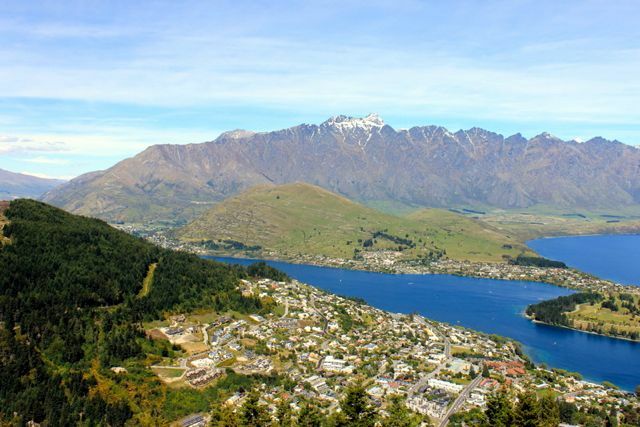 Spend today exploring Queenstown, perhaps ride the gondola up the hill for the views of your life. With only two weeks to spend in NZ, you’ll only have the chance to do a half-day hike on the glacier after the beautiful drive from Queenstown. Unless you are set on a heli-hike, which I have heard is spectacular though costly, you’ll be on Fox Glacier as Franz Josef isn’t available to hike right up to at the moment. Stay the night in the town of Franz Josef. You’ll spend at least half the day traveling across the Cook Straight to New Zealand’s “coolest little capital in the world.” We were able to take our car on the ferry there, but this was with more time. You’ll likely want to take a flight up with the time constraint. Enjoy Wellington’s vibrant nightlife on Cuba Street and in Courtenay Place. Spend today enjoying the city, including Te Papa, New Zealand’s captivating national museum (don’t miss! ), a cable car ride, and some good eats. 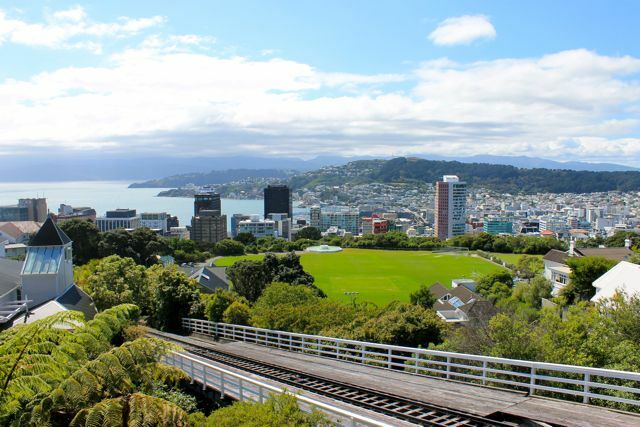 Be sure to take in the views from Mount Victoria lookout (It’s Mt. Vic to the locals), be beware the high winds. They don’t call it Windy Welly for nothing! …With an optional day hike in Tongariro Crossing! Crowned New Zealand’s “Best One Day Hike,” you won’t likely want to miss Tongariro National Park — though it is south of Taupo by about an hour and takes 7-8 hours in total to hike. Weather and volcanic conditions change rapidly, so be aware that even if you plan to hike the crossing, you may not be able to. 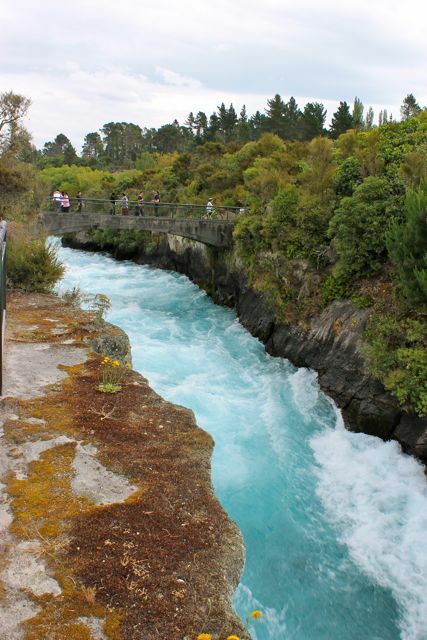 If you’re spending the day in Taupo, make sure you see Huka Falls, which you can drive or hike to. Hold on to your noses, as this volcanic hotspot smells. 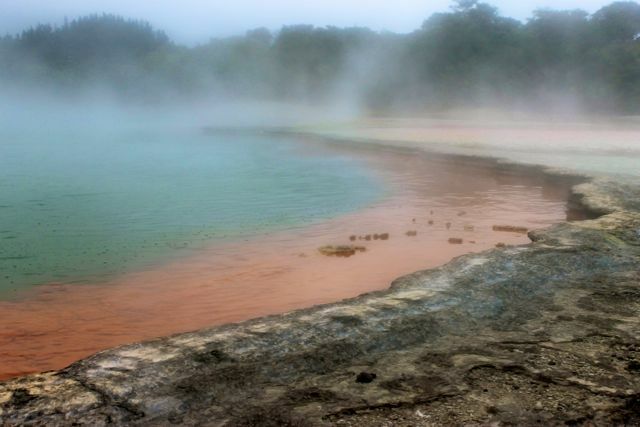 A huge draw for many to New Zealand, I felt that Rotorua underwhelmed me. 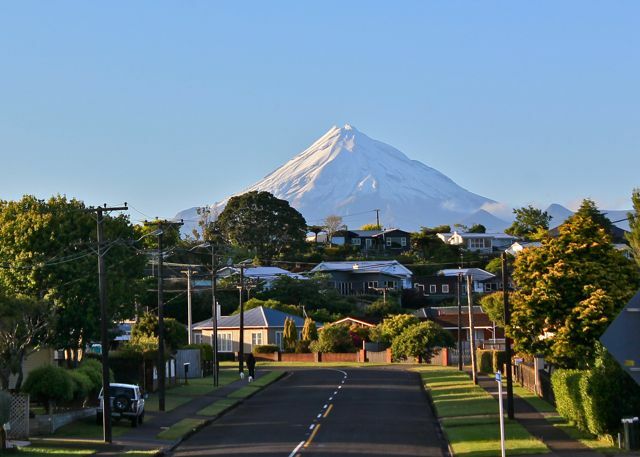 A must-see are some of the volcanic landscapes, a favorite being the “Wai-O-Tapu thermal wonderland.” Other activities here include zorbing, Lake Rotorua, natural hot springs and mud baths, and a gondola/luge similar to Queenstown. If those activities appeal to you, be sure to allot extra time here. 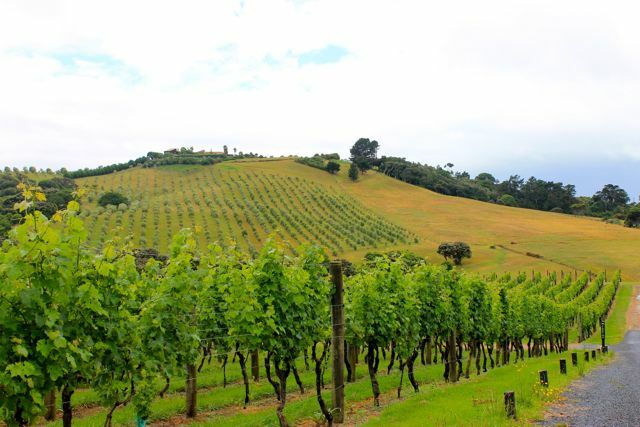 Spend the morning driving to Waitomo, an otherwise unremarkable (if there is such a thing) sight of North Island countryside…but only above ground. 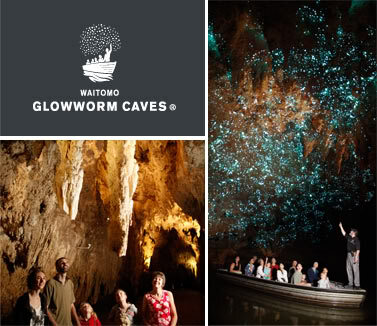 Come for the glowworms and the caving, stay for the glowworms and the caving. There are three caves available for your viewing pleasure, but a short tour of the main glowworm cave will be enough to wow you. You can’t come to the Bay of Islands without getting out on the water. 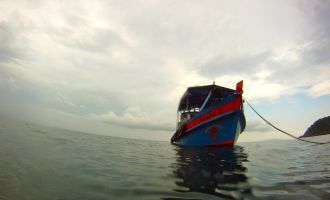 There are many cruises and dolphin discoveries to choose from, but there’s nothing quite like a night on a “floating hostel.” Yep, you heard me. 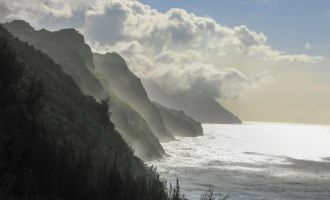 “The Rock” overnight cruise takes people of all ages on an adventure that includes hiking remote islands, fishing, night kayaking, snorkeling, bbq-ing, and even a paint-balling competition. You can’t beat it. So, you’ve made it back to Auckland. My suggestion is to head to one of the nearby islands by ferry. 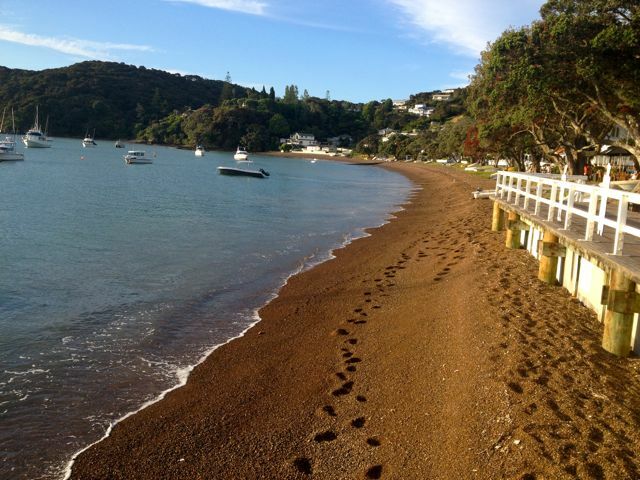 I can’t recommend Waiheke enough: great food, dozens of vineyards, beautiful beaches. Or you could opt to hike nearly Rangitoto island instead if you haven’t already. Either way, enjoy your final day in the most beautiful country on Earth! 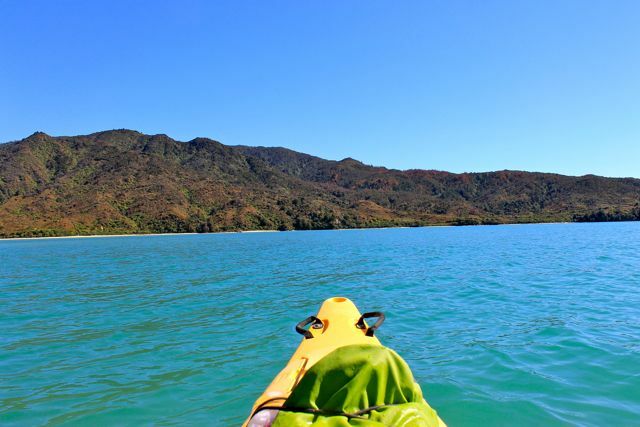 Note: You could opt to visit Abel Tasman instead of the Bay of Islands. Abel Tasman National Park was a highlight of my three week trip. It’s located at the top of the South Island, and makes for a good stop in between the glaciers and Wellington. 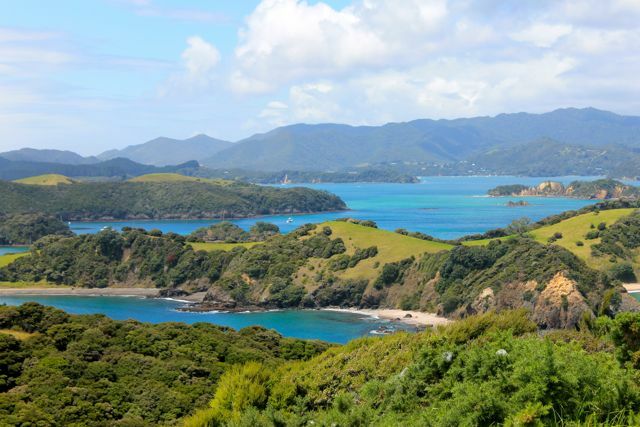 Though quite different, it offers many of the same activities and beauty as Bay of Islands. The choice is yours! 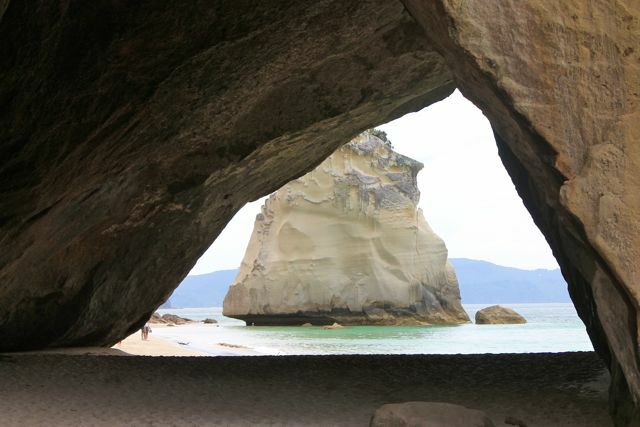 Don’t miss: Cathedral Cove, Hot Water Beach. Don’t miss: New Zealand’s best one day hike, the Tongariro Crossing. If you’re a fisherman, the fly fishing near here is world class. 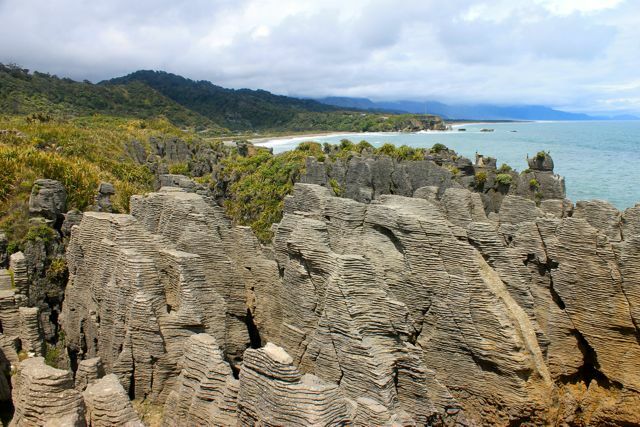 Don’t miss: the Pancake Rocks. In this extra week, it’s worth taking the time to do the ferry crossing across the Cook Strait from South Island to North Island for the views alone! 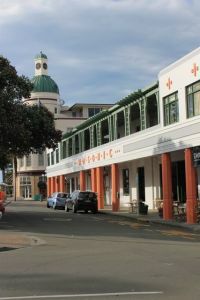 Located on North Island’s east coast, the town of Napier offers a magnificent art deco vibe and incredible wine tasting at nearby vineyards. It’s quite a journey to the very top of the North Island, but views from the place the Pacific Ocean meets the Tasman Sea are hard to beat. 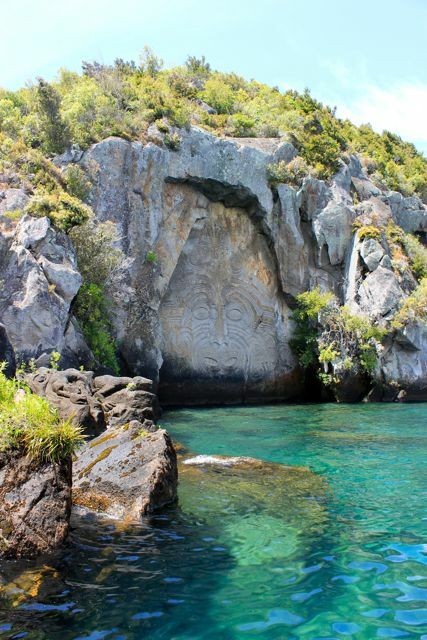 The place is sacred to the Maori people. Also up here is the Ninety Mile Beach and sand dunes. 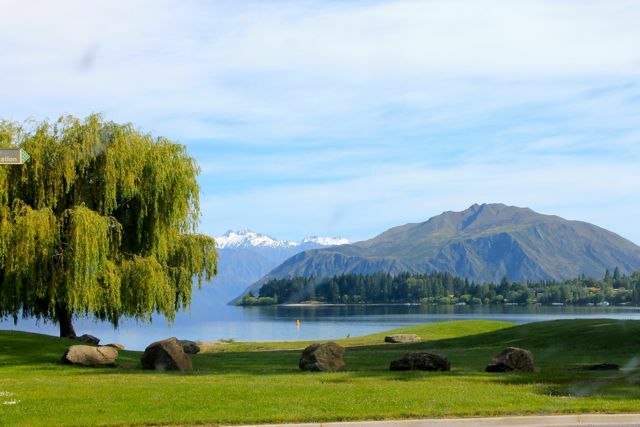 A small town with big-time beauty, Wanaka is just another absolutely stunning vista of mountains and water that is hard to imagine missing. Car rental: We found it was less than half price to rent in Queenstown rather than Auckland, if your planning permits. I hope this gives you a good idea of where to start when thinking about visiting New Zealand. Discovering this country and all of its beautiful quirks has been a highlight of all of my travels. Expand your planning with a good guidebook! Check out NZ Frenzy – it’s my favorite! It’s a great supplement to this book. (You can see more of my favorite photos from NZ here and here!) Also, thinking about bungy jumping? Read my experience here. Have you been to New Zealand? If yes, where would you say first time visitors should spend the most time? If not, where do you look forward to visiting most? Interested in seeing more itineraries? Subscribe to our mailing list and you’ll be the first to know once they’re here! Nice! Makes me want to visit the places I haven’t been to, especially Abel Tasman. Also I LOVE your use of allot. Yay! I posted this quickly from a hotel lobby this morning so I didn’t have time to read with a fine-toothed comb like I normally do. I’m so glad my word choice still appeals! You heard it here, people! From a NZ resident! 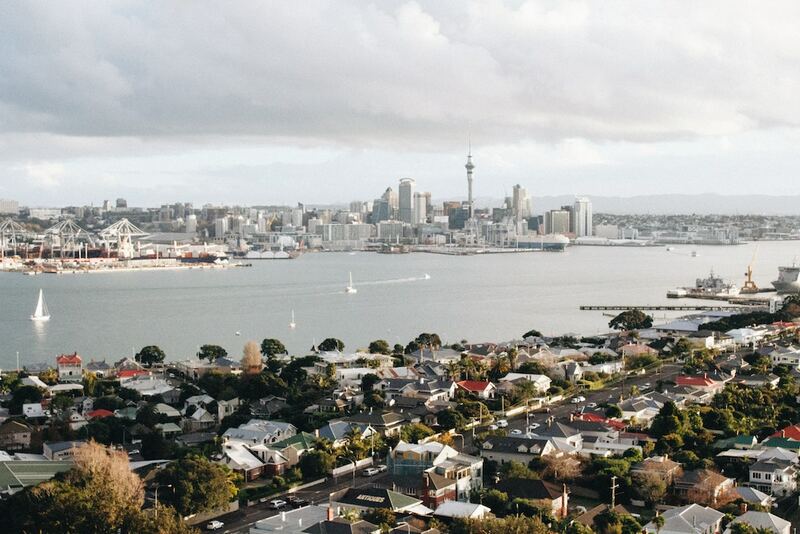 (Though she may be biased, as she is an Aucklander…) 🙂 The ongoing battle for the ‘best city in NZ’ title continues! Lovingly jealous. Like, I’m not mad at you, but still green with envy. It’s on our list, but I’m not sure the littles and Husb and I will get there 🙁 Can’t wait to hear about the Abel Tasman from our oldest! Ahh, NZ. I hear you because I’m jealous of the people who go and I’ve already been! Same could easily be said for you, my friend, living a fab life in Singapore! I have no doubts you and your family will get there someday 🙂 I can’t wait to see your photos, when you do! Going to New Zealand is definitely a dream of mine! There’s almost no place that’s farther away from where I live, though, but, I suppose, that’s half the appeal for me. The thing that is keeping me the most at the moment is probably the airfare – I’m still in university, so I can’t really justify that kind of money right now and travel within Europe as often as time permits. But once I get around to visiting NZ, I will definitely be referencing this guide! Also, I am jealous that you get to travel around Europe so much! The point is not so much that we travel to a certain place, but that we are traveling at all, right? Happy Travels!! Really awesome and detailed list! I couldn’t agree with you more about the Kiwi people. They are some of the nicest people around! I did a two week trip to NZ a few years back. We flew into Auckland then straight to Christchurch. Started the trip there. Drove all over the South Island. Mt.Cook, Lake Tekapo, Lake Ohau, Te Anau, Milford Sound, Queenstown (loved lugging down that mountain! 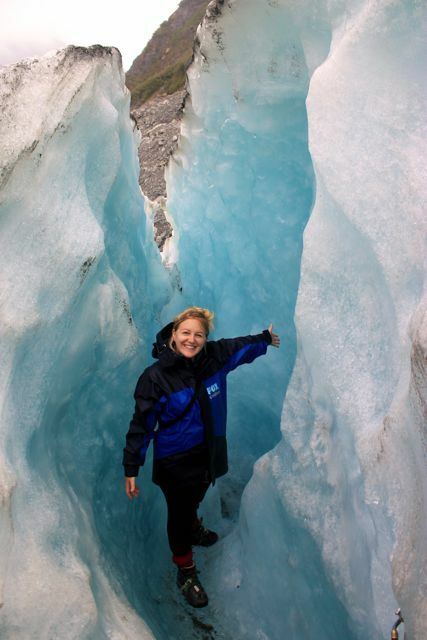 ), Fox Glacier, Franz Josef Glacier, Nelson, Abel Tasman. Then we continued the journey over to the North Island. Most of our time was spent on the South Island but still got a good amount of time in Wellington, Lake Taupo, Rotorua, and Auckland! What a trip!! And really the one that made me want to see the world! Hi Anne! I’m so glad I just stumbled across your blog!! We (mom, dad, and two middle-schoolers) are leaving in Oct. for 5 months. We are spending 10 weeks in SE Asia, 6 weeks in Oz/NZ, and 4 weeks in Europe, or something like that. I’m working on our NZ plan as we will be there in January, the busy season. I saw your tip on flying to QTown and renting our car from there because it is less expensive. Great Tip!!! I’ve checked prices and you are definitely right. We had planned to fly to Auckland, then drive to the SI, and most likely fly back to Auckland to catch our next international flight. By doing it the way you suggested, we’ll save hundreds of dollars. Thanks so much!! BTW…we are considering adding Burma to our itinerary. Is independent travel there pretty do-able? Hi Kellie! Great to hear from you! First things first — congrats on the big leap to travel…especially with children! I admire you. I’m so glad the NZ tips were useful to you! I am working on sharing similar information for each of the countries I have visited in my five months. One of those will most definitely be Burma. Independent travel is certainly possible and HIGHLY recommended, especially at this crucial point in Burma’s history. There is, however, a real lack of information (we relied heavily on Lonely Planet and even this was difficult due to ever-constant changes in the country.) I would love to share what I learned and encourage you strongly to add it to the itinerary. I can walk you through the FYIs I wish I had known. Please be in touch! 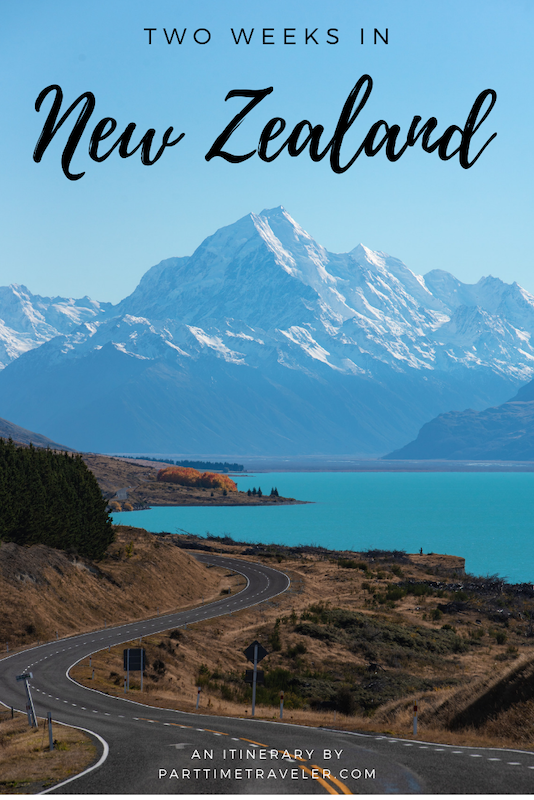 Wow this post makes me want to head to New Zealand tomorrow! I may have to convince my husband to make this our next big trip! It really is THAT beautiful! Let me know if you decide to go, happy to help in any way I can! Hi! I’m going to NZ with a friend this year from the middle of june to the middle of july. I know that’s part of the winter season over there, but where I live it’s summer and that’s when I have time off from uni – in other words the only time I can go. So I was wondering what time of year you’ve been there? What are the pros and cons of going in the winter, if there are any that you know of? Great post, it has helped our planning a lot! Thanks! As for me, I’ve only been in the summer (December.) From what I hear, it’s stunning year round. One bonus I know of is that there will be snow on the mountains, and many opportunities to ski! Another pro is that I would imagine prices/bookings would be lower/easier with less crowds. Keep me posted on your plans, I’d love to see some winter pictures! 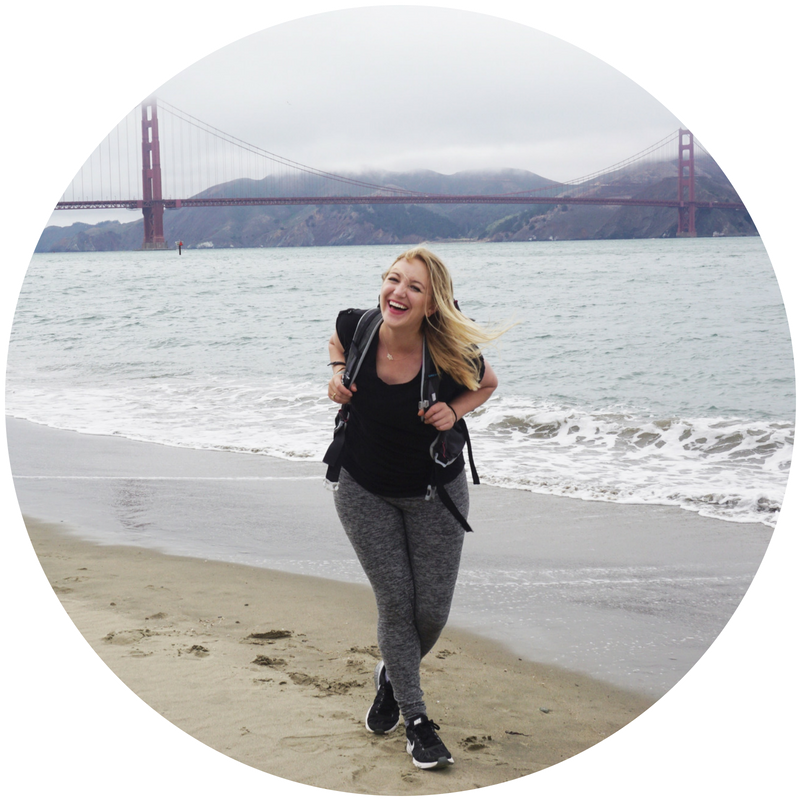 Thanks so much Anne for the tips and itineraries! My husband and I are off to NZ in January of 2015 and are planning to stay for 4 weeks. I am comparing your itineraries to others that I have found and am getting not a little overwhelmed. 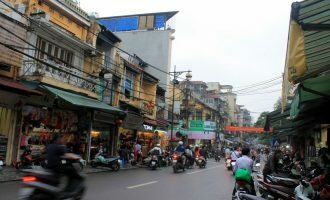 You outline the 2 week itinerary very nicely, but I am a little confused when I would fit in the other sites that you recommend for the weeks 3 and 4 itineraries. Could you please help place those extra sites for me within the 2 week itinerary? For instance, when would be best to fit in Coromandel since it seems to be pretty far away. Would it be best to go there after Day 10 at Waitomo before going to the Bay of Islands? Thanks SO MUCH for all your guidance and suggestions. My husband and I are seasoned travelers and like to go, go, go all day to get the most out of our traveling experiences. I just want to make sure and get the most out of our limited time in NZ and it looks like you have a wonderful list of places to go. Again thanks Anne! Hi Carolyn, thanks for reading and congrats on your upcoming trip to NZ! As for your question, it really depends what direction you are traveling from. Coromandel makes sense to add on the end of Auckland or Rotorua. It is a bit out of the way, but is definitely worth it! Make sure you see Cathedral Cove and the Hot Water Beach! One thing that might be helpful is to map out an tentative itinerary on Google Maps, using pins. Best of luck and let me know if there is any other way I can be of help! We are planning our honeymoon for next may and I am really keen to spend three weeks travelling around New Zealand, the only concern my fiancée has is that she has heard the weather can be quite bad then and it is putting her off. Is May a bad time to travel or would you recommend it? Hi Declan – congratulations on your engagement/wedding/honeymoon! I traveled through New Zealand in December (their summer) but I have dear friends that live there year-round. Let me ask them about May specifically and get back to you. Feel free to email me with any other questions! Love your post! Trying to figure out the best way to see both islands in two weeks. We are flying in and out of Auckland. Thinking about taking your advice and flying straight to Queenstown. I might have missed this in your post but did you drive all the way from Queenstown to Auckland with your rental car and then drop it off at the Auckland airport or nearby? Did you just use the ferry to get across or did you just rent a different car on the North Island? Thanks! So glad I could help. Happy travels, Laura! Sorry but I have one more question….Did you go to Dunedin and the Larnach Castle? I was wondering if its worth going over there? Thanks Anne! Hi Laura, I didn’t make it to Dunedin. Nothing against it, I just felt compelled to prioritize other NZ spots. I didn’t get to Christchurch either. Let me know what you think if you go! Hi Kate! 20 days in NZ will be awesome. I’d say see if the flight is cheaper into Sydney or Auckland from BA and then start there. The flight is ~3 hours between the two (farther than I imagined!) but closer than you will be from other parts of the world. The hop-on hop-off bus is Kiwi Experience. I haven’t done it myself but have heard nothing but great things! 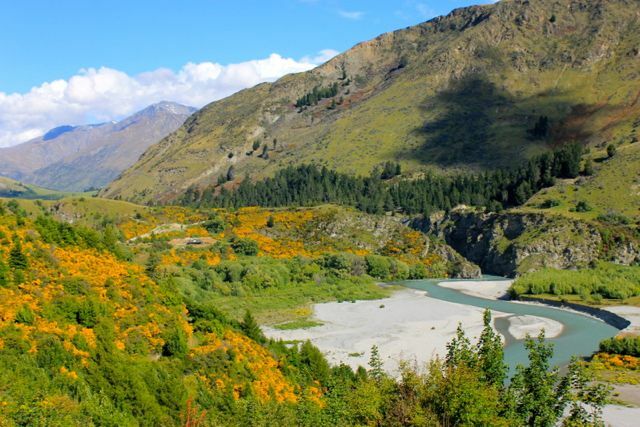 Must-sees are many, but one thing that may help is to focus more on the North or South Island. I personally found the South Island to be more scenic and fun, but the North is also incredible!! Have a great round the world trip!! !